Giving this show one’s full attention means an award~ a psych ward. How utterly stupid is it to copy MKR,gice? I’m softening Family Food Fail’s banal blows with a mute button and Led Zeppelin. I also need an award for watching. If the Samadi get into the finale, I won’t be watching tomorrow night. So far, the boys should win after the first 2 courses. This could be the first show where the audience get Logies for watching . No way the Samadis will beat the boys. The judges just trying to make it look close. Thank goodness is all over soon. ” I’m a little bit concerned it’s under cooked ” says Tom of the chicken. Little bit? You can’t be serious. It’s pinker than Anna’s hair ffs. Someone needs to tell the judges and the contestants how to pronounce taco and tortilla. They’re putting my teeth on edge with their mispronunciations. 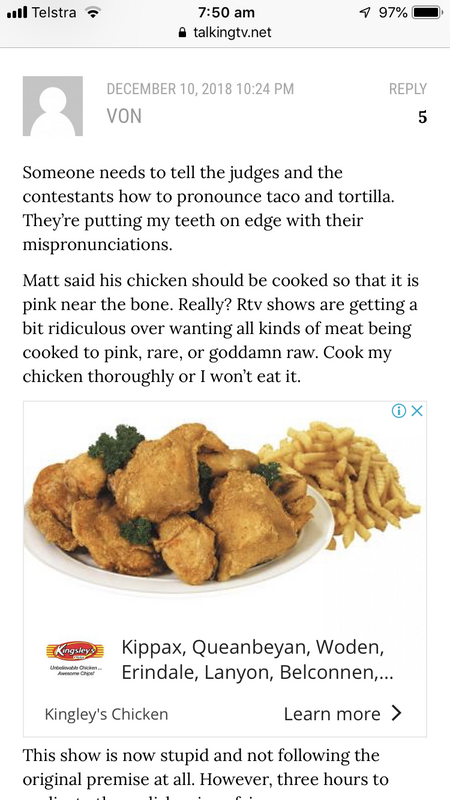 Matt said his chicken should be cooked so that it is pink near the bone. Really? Rtv shows are getting a bit ridiculous over wanting all kinds of meat being cooked to pink, rare, or goddamn raw. Cook my chicken thoroughly or I won’t eat it. This show is now stupid and not following the original premise at all. However, three hours to replicate those dishes is unfair. Ha, Von, look what ad showed for me within your comment! Are they eavesdropping on you? That chicken and chips doesn’t look very appetising; maybe I should have mentioned pork. Even the parsley contrast doesn’t work. Yay, that nasty woman and her sister are gone. I will barrack for the guys in the final. The Giles women are fine, but I really like that the guys can laugh at themselves and gently poke fun at the whole process. That’s nothing to do with how well they can cook, although I think they’ve done well at that, but half of this series wasn’t about cooking, but drama instead. I’m a little disappointed because I was going to throw an impromptu Christmas party for all of us not watching tomorrow night if the Samadis won. Sorry, gice. Oh thank God those nasty girls didn’t get through. I was panicking when he couldn’t get his panna cotta out but thank God he finally did. But there were 4 more in the fridge. Don’t know why he didn’t just get another one out. Didn’t he oil it first? That makes it easy to get out. I kind of cheered when the girls put the pastry in the oven instead of on top of the tart. It was concerning me that he got the panna cotta out on his flippin’ hand..Got to be a more hygienic way to do that. The girls did that too! Yak! Ridiculous. Only have 3 hours to cook 3 dishes. Such a coincidence that the second dish is a dessert. As if to cook to the word family will be a dessert. Im working away from home, had to take a family call right as they finished eating the tiramisu. After watching the whole damn series (well, probs ffwded half of it) I missed the rest of the finale lol !! Well after the nasty ones left I would have been happy with either winning. It was very close in the end. I actually thought the guys would win. If it returns next year (and it may not as ratings were low – lucky they have made money selling the format overseas), how do you think they can salvage it? Teams of three instead of two? Less emphasis on making an Anna sweet creation? More cooking in their own styles? Better casting in general? Give Tom a pink Mohawk and make Matt wear sparkly bomber jackets? They could ditch Anna altogether and do a MasterChef with guest chefs. Vote in the new FFF poll, please. Teams of three sounds better. An odd number would mean that one family member, say a nutsy one like the nasty Samadi, could be overridden by two others. Anna’s challenges should be less MasterChef and more like something any home cook has a chance of accomplishing. I’d prefer less cooking in their own styles. The contestants should have to stretch themselves and get away from what they are comfortable with. I’d appreciate it more if the judges acted like chefs in their critiques, rather thatn people who wandered in off the street for the tastings. Find some adjectives, judges. I would prefer a dessert challenge where Anna presents some wacky chocolate cake for them to ooh at, and then says: Now make me your best ever chocolate dessert. So they can still do there own thing, but to a theme. I just realised my FFF finale did not record. Is it worth me watching online and fast forwarding through the faff, or should I not even bother? I’m sure there will be an encore over the weekend. I enjoyed it.